It was Sports Jersey night at the Glutes Smokin’ Lounge in Kemptville, Ontario, but it seems that only Glutes and I got the memo. No problem, everyone still had a great time, and I was gifted a gorgeous corn-cob pipe for remembering. Gilbert and I went into his humidor and pulled out a couple of Robaina XV Aniversario (Exclusivo Canada) from October, 2012. These are big sticks, at 6.5” long with a 54 ring gauge. 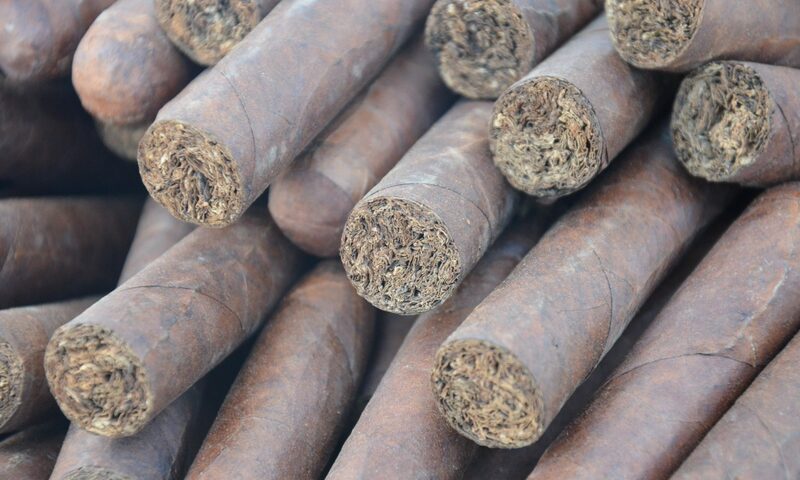 It is a powerful cigar, not for the faint of heart. Because it is such a long cigar, I was able to record several videos throughout, discussing the dime-stack ash (and explaining what we mean by that), as well as showing how two different people can smoke the same cigar so differently. Gilbert’s cigar coned for the first half but fixed itself nicely as he smoked. As well, Glutes obviously smokes his cigars faster than I do, and he was finished a lot quicker than I was. When I say quickly, it is a relative thing, as this monster stick was good for nearly two hours for him, and just over that for me. Gilbert discussed his pairing with a Peat Monster blended scotch whisky, noting that the heavy peat of the whisky matched well with the powerful cigar. We both gave the cigar a big thumbs up, and our only regret is that it was only a Limited Regional edition, which means it was only rolled for the year 2012. As well, it was quite pricey, as all Regional Edition cigars tend to be. Nonetheless we both enjoyed it, and would not hesitate to revisit this beauty again.